From Tathra you enter the region known as the Sapphire Coast for the blueness of its water. You follow the Kangarutha Track out of the town and on to the heath-covered cliff line. Much of the walk here is beneath a dense canopy of paperbarks, as the track crosses a series of creeks and passes stony and sandy inlets. Eventually, it takes you to Wallagoot Gap, an impressive opening in the cliff-line to a hidden bay. It also marks the end of Wallagoot Lake, held back from the sea by a broad sandbar. You are now in the heart of Bournda National Park and, leaving behind the Kangarutha Track, have a chance to wander through the coastal habitats of Wallagoot and Bondi Lakes, plus Bournda Lagoon - an area of tall paperbark forests. After a stretch of beach-walking along North Tura Beach, you pass through the quiet streets of Tura Beach village, before regaining the sand at Short Point Beach and following that into the resort town of Merimbula, set around its fine inlet and lake of the same name. Crossing the inlet via the road bridge, you walk across past the holiday homes of Fishpen Peninsula, before strolling 5 km down the broad sweeping curve of Merimbula Beach to Pambula. Here on the other side of Jiguma Headland and Nature Reserve lies the mouth of the Pambula River, a lovely forest-lined stretch of water. It is best crossed at the turn of low tide, as it must be swum to reach Barmouth Beach and the start of Ben Boyd National Park. A dirt road leads through the forest to reach a 6 km stretch of sandy beach heading south. 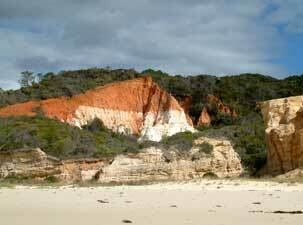 Halfway down, you pass the Quoraburagan Pinnacles – a series of deeply eroded clay cliffs tinted in shades of white, cream, tan, pink and burgundy. The beach ends at Terrace Point, where you re-enter the coastal forest to follow a dirt road through to the outskirts of Eden. Descending to Aslings Beach, a boardwalk takes you around the edge of Curalo Lagoon to finish the section in Eden, an old whaling town set on the shores of Twofold Bay, which is now a centre for the local timber industry. This is a fairly straight forward section along named tracks, beach and forestry roads. The Pambula River can be swum at the turn of a low tide, but has strong currents. It might be crossing where a local boatman could take people across for a fee. The final descent from the forestry road to Curalo Lagoon, north of Eden, probably needs checking as there is now a new subdivision on the north side of the lagoon.